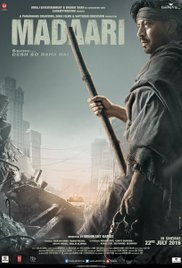 It would be hard to accept that every word of "Madaari" is based on a true experience, because it explores what many of us might hope for, but never, ever expect to see. The focus is on corruption with the protagonist determined to expose it. We root for him, even though he is using extreme means. A few powerful men want him killed. In some ways it is a typical suspense movie. A young boy has been kidnapped, his desperate, but powerful parent uses his resources to pursue. An intelligent officer gradually uncovers information while the tech savvy kidnapper manages to stay one step ahead. Before it is resolved there is a great deal of tension. Actually it is more than just a suspense movie, it points to how endemic corruption can become. As one character declares it is not that individuals are corrupt, but that the structure of the government breeds corruption. It doesn't matter who gets replaced, corruption will resume. The protagonist uses the media to make his point. The climax is satisfying in that the protagonist is able to force crooked government people to confess before a live camera. As you might imagine that would be quite a trick and I don't want to spoil how he does it. The Stockholm Syndrome is brought up and helps create a maudlin few scenes, that might make some people cringe, but I found believable. It works for me because they point out the opposite of the usual viewpoint in this case that the kidnapper can also become attached to his victim. When you think of his original impulse it seems credible. Irrfan Khan has a long history of challenging roles and is fairly well known in America for such films as "Life of Pi." "The Amazing Spider-Man," "Slumdog Millionaire," "Inferno" and even some tv. series. But he is even busier in India with standout performances in such movies as "Talvar," "The Lunchbox," and "Life in a Metro." He has won more than his share of awards including 3 Filmfare. Jimmy Shergill plays a ruthless clever detective tracking down a very resourceful kidnapper. Some of his notable films include "My Name is Khan," "Lage Raho Munna Bhai" (one of my favourite comic movies) and "Traffic" where he played the critical role. The young kidnapped boy is played by Vishesh Bansal who had previously played in a tv. series. He was very effective as a spoiled young boy gradually coming to like his kidnapper. His parents were effectively played by Tusher Dalvi and Ayesha Raza. Nishikant Kamat, director has been involved as writer in other projects dealing with corruption. He wrote and directed "Drishyam." http://www.therealjohndavidson.com/2015/11/driishyam-bollywood-remake-masterpiece.html His first film was in Marathi and for his next film he is doing another. Also did a Tamil film with a corruption theme. Sutapa Sikder, Irrfan's wife was one of the producers. Previously she had written dialogues for "Kahanni" and "Drishyam," two top movies. Avinash Arun was the cinematographer who had filmed "Drishyam" and "Massan." His one directed film was in Marathi. Sameer Phaterpekar composed the music and like other crew members also worked on "Drishyam." Another producer Shailja Kejriwel also supplied the story. He has produced a number of movies in the Urdu language. Most viewers would enjoy this movie if you like a little suspense well presented.